It's increasingly rare that music tackles politics at all, let alone tackles politics well. It's even rarer for the genre to be jazz. Your Queen Is A Reptile draws from Gil Scott Heron and Max Roach to distil a strong jazz statement. Sons of Kemet have a new approach to the protest song: positive, motivated, and energetic. Shabaka Hutchings' compositions are focused, and overwhelming at times; and as effective as instrumental pieces as they are with lyrics. My Queen is Ada Eastman is a spritely, pushing opener. Tumbling drums and a repetitive rumbling tuba hook leave space for lyrical tenor melodies, before the introduction of Joshua Idehen changes the track: the rumble swaps for a sinister bass line, and spinning loose grime lyrics full of London Pride and angry sentiments. This energy is drawn through the album, My Queen Is Angela Davis sees interrogative, synchronised horns running together over crashing drums, before splitting and combining with some baroque interplay. The tuba and drums channel Rage Against The Machine fervour, beneath a clambering tenor line. My Queen is Albertina Sisulu showcases the impressive range and speed of Theon Cross' tuba; My Queen is Nanny of the Maroons leaves the drum pair, so often the discreet facilitators, at centre-stage with a delicate beat. 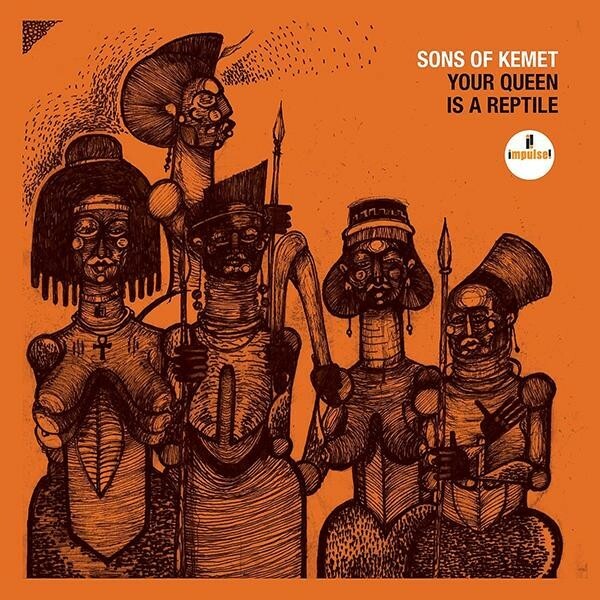 While still built around the core of Hutchings, Cross and Tom Skinner on drums, Sons of Kemet have opened the doors to the studio for this album. There are junglist vocals and dripping dub echos from Congo Natty, and Pete Wareham joins Hutchings for an introspective saxophone duet, but it is Seb Rochford who is the guiltiest repeat offender of four guest drummers featuring. With so many Polar Bear band members popping up, it is interesting that My Queen is Yaa Asantewaa is where the neat double saxophone work is perhaps the most Polar Bear-esque, Hutchings playing with a tender Mark Lockheart lyricism in tandem with Nubya Garcia, stringing long melodies and raw improvisation over a narrative marching story. My Queen is Harriet Tubman is perhaps the stand out track – all vibrant interplay between tenor and tuba, and three drummers producing a fantastically organised percussive wash. Intense and coordinated, with nimble transitions and insistent rising choruses, this is a pared back brass line-up producing blustering energy to rival posses like hypnotic brass ensemble. Your Queen is A Reptile has bite. The record's liner notes and book-end tracks are penned by Idehen who eloquently and fervently makes a case for rephrasing history, and redressing the hereditary power imbalances we're still burdened with. It's playfully confrontational – any reference to David Icke and our shape-shifting lizard overlords must be – but there is real feeling which seeps through via returned-to refrains “Your Queen Is Not Our Queen. She Does not see us as human”, and a dynamism which boils through the musical tone. And however you feel about the monarchy, the accusatory title makes you start, and consider historic responsibility. What's refreshing is that the titular rejection of one Queen leaves much space for positive replacements. This album is about role models – each song a story of someone who strived and redressed imbalances and injustices. If you're as ignorant as me, the track list is also an education in inspirational women, from Jamaican National Heroes, US psychologists, Civil Rights leaders, and great grandmothers. Your Queen... isn't about symbolic republicanism, it's about having a representative society with a modern humanity; it's about calling for a refresh of our society and politics. We shouldn't be surprised: Shabaka has penned 'a note to the new government' in 2014, and another of his projects Shabaka and the Ancestors produced a stirring political call-to-arms at Love Supreme last year. Approaching the 50th anniversary of Enoch Powell's “Rivers of Blood” speech, Your Queen Is A Reptile is the perfect rebuttal to that race-based fear: a positive original political piece showcasing cultures and integration, and demanding better. It is celebratory evidence produced by the very populations he was vilifying. And it's also just a cracking album. To the anonymous commenter on this piece. Thank you, we'd love the benefit of your knowledge of grime, which we are sure would be additive to Dan's review. So please first identify yourself and let's start a civilized conversation.